SPRINGFIELD, MO. — Louisville basketball coach, Rick Pitino, has been named the keyote speaker at the annual Steak and Steak Dinner to raise funds for the Boys & Girls Clubs of Springfield, Missouri. The event is scheduled for Tuesday, April 22, 2014 at the University Plaza Convention Center in Springfield, MO. Photo shows Louisville coach, Rick Pitino, promoting himself as keynote speaker at the annual Steak and Steak Dinner set for April 22, 2014 at University Plaza Convention Center. Mercy Hospital has been the primary sponsor for several years. It will raise funds to support the more than 3,000 members of the Boys and Girls Clubs of Springfield. Many of the youths come from disadvantaged circumstances and depend on the club as a stabilizing force. To donate to the event, Mercy is offering several different levels of sponsorship: at $5,000; $2,000 and individual at $250. 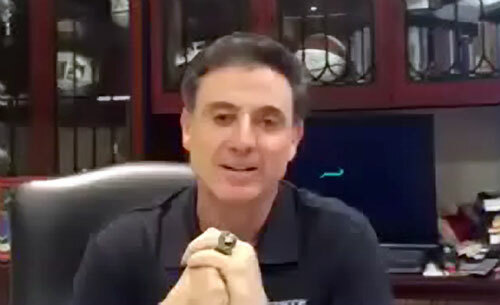 Pitino, the only coach in NCAA history to take three different teams to the NCAA Final Four, joins a list of past athlete speakers including last year’s speaker, Nick Saban, from the University of Alabama football coach, NFL Hall of Famer Mike Ditka, Boston Celtics icon Bill Russell, New Orleans Saints quarterback Drew Brees, and former University of Kansas and current University of North Carolina basketball coach Roy Williams. Sports Speakers 360 is a booking agent for motivational sports speakers. If you would like to book sports legends or coaches like Rick Pitino for a speaking engagement, personal appearance, endorsement, or corporate event, contact our booking agent for appearance and speaker fees at Sports Speakers 360 or call 1.855.303.5450.